Before we move on and leave Queenstown altogether, I want to add a picture of the remarkable mountains surrounding the city. They are called: The Remarkables. A bit disappointed about the closed Deer Park Heights we decided to leave and continue to Te Anau in Fiordland. 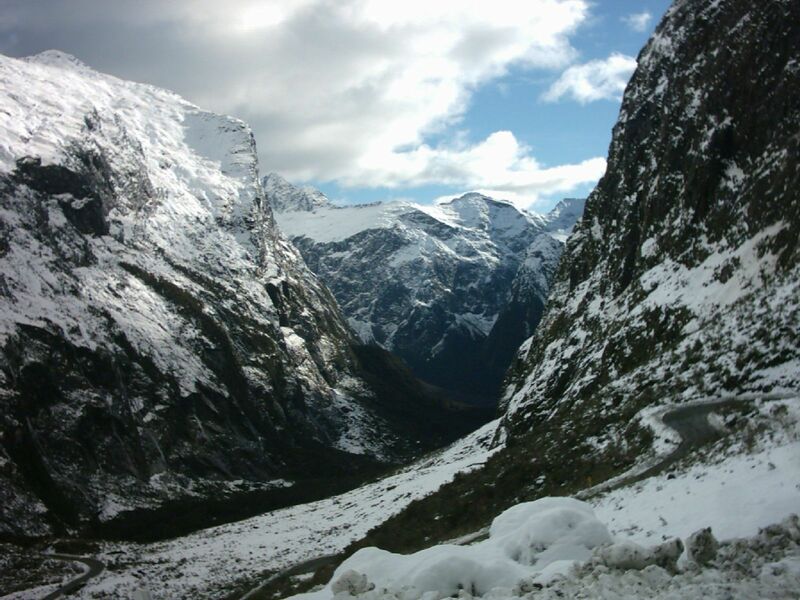 Fiordland is the southern most state in New Zealand and also the coldest. Even in summer it can be quite chilly. As the name suggests Fiordland hosts an amazing number of fiords. The southern end of the Southern Alps give the region a number of tall and beautiful mountains. The far inwards reaching sea is contributing sounds and fiords. Ancient glaciers contributed to the landscape by carving far stretching valleys and forming countless crystal clear glacier lakes. With the rough vegetation that defeated the tough circumstances Fiordland really becomes an unique place of wonders. Nature did better than mankind making Fiordland the least inhabited (in 2001 it had 48 inhabitants!) and worst accessible place in New Zealand. There is one single road leading from Queenstown over Te Anau to Mildford Sound and it has to go all around the mountains for 300 km. Not speaking of all the other beautiful places here, which are not or even harder to access. Like Doubtful Sound, one of the biggest and most beautiful Sounds, which is only accessible by water. There are not cities and only two settlement that barely can name themselves towns: Manapouri and Te Anau. Te Anau the bigger one still has less than 2000 inhabitants. The few people that live here and the increase of numbers is due to the increasing interest of tourists in this region. Most of them heading to Milford Sound. Nonetheless Te Anau came to be and despite its focus on tourism its a nice little town with one supermarket and a few nice shops along the main road. It even has a library and other public facilities. The local DOC centre should be visited to gather information about walks and activities in the area. 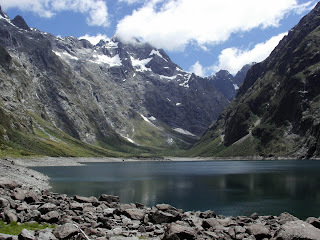 We picked up two hitchhikers on the way to Te Anau and together we drove up to the gateway city to Fiordland. Once there we made our way to the DOC centre to check out our tramping options. We took a really long time deciding our next step. On the one hand we were itching for a bit of longer tramping. On the other hand we were really running out of time and worried that we wouldn't reach Picton in time for our ferry back to the North Island.